Autumn in Amsterdam means jazz, wine, cozy get-togethers with friends, lots of laughs, and Friday stay-ins. Nevermind its size, Amsterdam has dozens of events to offer and it is hard to monitor them and choose the cool, unusual, and worthy ones. 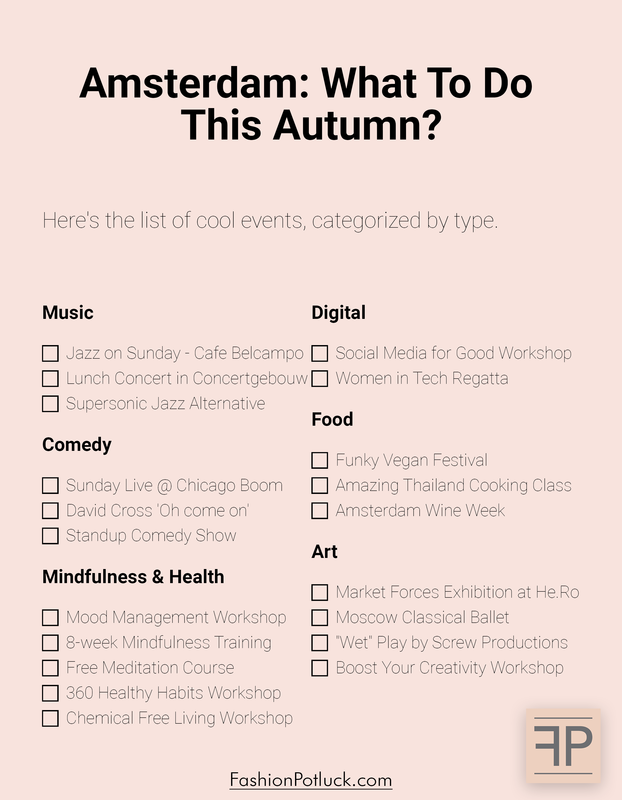 You might have seen our recent blog article - What to do in Amsterdam this Autumn 2018: Music, Lifestyle, Food, and Business events. (with prices and addresses). Based on this article, we created this checklist for you to use. Print it, put it into your room, mark the events you want to attend, cross out the events you went to. Let's see how many events we can attend this season. You can find all the information about the events, the tickets, and the addresses inside the article. Enjoy!